The Birds begins like a sitcom, or at least like a low-rent TV project from the 60s. We’re introduced to the pretty girl, Melanie Daniels, played by Hitchcock’s final cool blonde Tippi Hedren, as she is kept waiting for a pair of birds from a bird shop. A handsome, mysterious man who knows all about her plays a prank, sort of payback for Melanie’s infamous practical jokes. The man is Mitch, a lawyer, and Melanie is a playgirl with a rich newspaper tycoon father. She buys a pair of love birds for Mitch’s sister, Cathy, and secretly brings them to Mitch’s family home in Bodega Bay, California. Their playful banter is disrupted by a swooping seagull who takes a peck out of Melanie. We meet Mitch’s mother, Lydia, who would disapprove of any woman Mitch brings home. Just ask the town’s schoolteacher, Annie. When Mitch’s father died, he broke off their relationship, and she moved to Bodega Bay just to remain close. That was four years ago, and she and Lydia are now friends. It seems Lydia hates the idea of being abandoned. Melanie and Annie become accidental friends when Melanie lies to Mitch, insisting she was coming to Bodega Bay to visit her old college chum. Annie’s name she got from the general store. Ordinarily in a Hitchcock film, this material would be the real story, and indeed it is in The Birds. The bird attacks are merely the MacGuffin, but there is a superficial quality to this film. The characters are thinly sketched and merely archetypes. Mitch is the strong handsome lead, Melanie is Hitchcock’s heroine, the character through which the story will unfold; Lydia is a dominating Hitchcockian mother, selfish, violent even, and Cathy is the innocence that was intended to really jab at the audience once the horror starts. Annie is the only human being in the cast. We can understand her pain. She sticks close to the man she loves because that is all she can have. This character is similar to Norman Bates and Marion Crane from Psycho. The others are quite frankly boring, and the performers can’t save them. A weakness of the picture is usually something that saves Hitchcock’s subversive characters: the actors. Here the two leads are a letdown. Tippi Hedren is fun to watch. She’s beautiful but not typically so. There’s an odd quality to her. Her voice is high-pitched, raspy, and awkward, and as a movie personality she does well. She’s very curious, though. Sometimes she delivers her lines well, other times, more often than not, she is unconvincing. I can’t really fault Rod Taylor as Mitch. I just wasn’t interested in him. Hitchcock should have chosen Rock Hudson, someone who looked younger, more boyish and possessed more charisma. Mitch and Melanie’s relationship was not organic. It felt forced. I wonder why disasters are always aphrodisiacs in the movies. There’s an embarrassing scene on the sand where we learn something of Melanie’s back story. We find out her playgirl days have made her a mature woman, that the lifestyle ruins reputations and she is devoting herself to good causes now. We also learn of her deadbeat mother, and partly due to Hedren’s delivery but mostly to the script, the sentiment is false and truly laughable. It’s predicable, and Hitchcock is too good to be predicable but there you have it. The supporting performers are fine. Jessica Tandy chews the screen in subtle ways as the mother. Of course Suzanne Pleshette is fantastic. She brings a rare quality to a Hitchcock role: grittiness. Annie is a real woman: attractive but not glamorous, frank, honest, and a little bit depressed. I personally found Veronica Cartwright very effective for her generation. I guess I must say this because when I saw the film with an audience, everyone was laughing at the portrayal of all the kids. It’s just too old-fashioned for modern viewers. I may be being a bit grumpy but why then were these people in the theater? They know the film is old—grow up! Actually I was very upset when I left the theater. There was too much laughter during the screening. An old couple sitting next to me said that the great thing about seeing a film like The Birds with an audience was hearing the nervous laughter during the tension-filled scenes. I did not contradict them but they were out of touch. No one respects the movies anymore. I saw the film at the Coolidge Corner Theater in Brookline, MA, the Boston area’s most well known independent theater. Their programming is often banal, showing the more ordinary independent stuff. I’ve noticed that the audiences typical of Coolidge are kind of would-be movie snobs, the sort who prefers to drop various names and titles during discussions but who have no true understanding or appreciation for the cinema. There was a lot of laughter during the area premiere screening of the complete Metropolis and there was laughter at The Birds. Moments like the attack at the birthday party. There’s a shot of a little girl face down on the grass as a seagull pecks at her head. I didn’t find the image funny. There was one moment where the film shut the audience up. It’s probably the most well-known shot in the film, where Lydia wanders into her friend’s house and finds him dead with his eyes plucked out. You could feel the audience was disturbed. It was a thick atmosphere, but people still found things to laugh at. Perhaps the idea of birds run amuck just isn’t believable. I grant you that while walking down the streets of Boston it is ridiculous to imagine that the common pigeon will start attacking. But this is the movies—this is a Hitchcock movie! Suspend your disbelief otherwise stay home. The moment I expected laughter (and was actually dreading because I found the constant laughs inappropriate) was met with silence. It’s the semi famous moment when Melanie watches as a trail of spilled gasoline catches fire. Hitchcock chose a strange series of parallel action, where the shot of the encroaching fire is disrupted by freeze-frame images of Hedren with her mouth agape. The problem with it is that her shots are held too long and the people behind her move at normal speed. The silence from the audience is probably due to the very palpable scene Hitchcock had staged. It is one of many of the film’s later moments that are filled with tension and dread. The Birds was ahead of its time in one way: it is the first of the modern-day disaster pictures. In fact, I found parallels with two very popular and effective ones: Night of the Living Dead and Jurassic Park. Spielberg’s movie is reminiscent because, like The Birds, it has innovative special effects and is terrifying about Earth-bound creatures attacking humans (granted dinosaurs are long extinct), but both also lack seriously developed characters, leaving the only points of interest with the attacking animals. Night of the Living Dead is a more apt companion film, and it is easy to see that George Romero took the structure of Hitchcock’s picture and many of the ideas as well. In both films there are languorous openings that suggest a different kind of story will be told instead of the one we’re given. Both feature characters terrified by the danger outside their home, boarding up the place, and then turning on each other once the terror becomes unbearable. They both also succeed as brilliantly claustrophobic and downright depressing exercises, though Romero’s film is much more shocking and sophisticated. Though it was made only 5 years later, Night was made in a different time in American film. The Birds begins carefree, with hope and promise for its characters but all joy is robbed by birds. Where Hitchcock succeeds is also where he fails. The Birds was a film Hitchcock almost never made. After Psycho, another accidental project, Hitchcock was developing Marnie as a return vehicle for Grace Kelly. The Birds was made instead because Kelly regretfully turned down Marnie, and with Psycho’s unbridled success the director turned out another devastating horror film. It feels to me that Hitchcock gave up with The Birds. He was cashing in on the audience’s expectation of his moniker but he failed to find the key to his success: a tight script and convincing characters. The Birds never feels like a work of cinema. It feels like a cynical exercise, even though it is technically well made and possesses some great cinematic moments from The Master. The film is innovative too in its sound design. It is very effective, and apparently much of the credit goes to composer Bernard Herrmann. Herrmann is the greatest, most important composer of the 20th Century, but The Birds exists without a note of music. 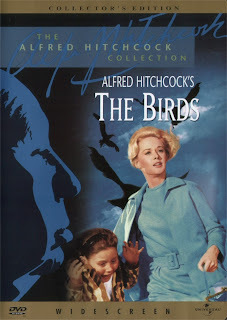 The composer, Hitchcock’s creative partner for nearly a decade, convinced the director that the film would work better with only the sounds of birds. In comes a machine called the Mixtur Trautonium. Along with the Theremin, it was one of the early electronic musical instruments, and this machine, a precursor to the synthesizer, created the shrieks for the birds. I noted, however, that we seldom hear actual birds in the attacking scenes. I recognized cats and chimpanzees, but in the chaos these were believable sounds. In fact, the sounds probably caused much of the chaos. Hitchcock must have been appreciative as Herrmann received onscreen credit as “Sound Consultant”, but this may be equally due to their friendship. Another nice bit of sound is during the final scene, the massive shot of the exterior of the house littered with waiting birds. There is the sound of wind, of pressure, something almost subliminal that suggests unease. This reminded me of the great electronic score for Tarkovsky’s Solaris. There was a problem, though, and it might have been unique to the print I saw, but the bird attack scenes were way too loud. The dialogue and other scenes were at a normal volume, but the frightening scenes could have been turned down. I do regret that Herrmann did not write music for the film. I think it would have helped cement the film, made it tenser and its characters seem less simple. The example to go by is Hitchcock’s own Torn Curtain. Herrmann wrote a score but Hitchcock rejected it. The film with its current score is good but like The Birds weakly sketched. Herrmann’s score would have shaded in the characters, and I feel he could have only helped the film. His and Hitchcock’s collaboration is legendary, and together they created the best American films of the 50s and 60s. One artist fed off another, and their work is probably the definitive example of a director / composer relationship. If nothing else, Herrmann’s score for The Birds would give us one more Herrmann score. I’ve never been impressed with The Birds. When I first saw it in high school I felt cheated by the ending. Now I accept it and even think it’s the only way the film can end, but as a film it does not succeed. 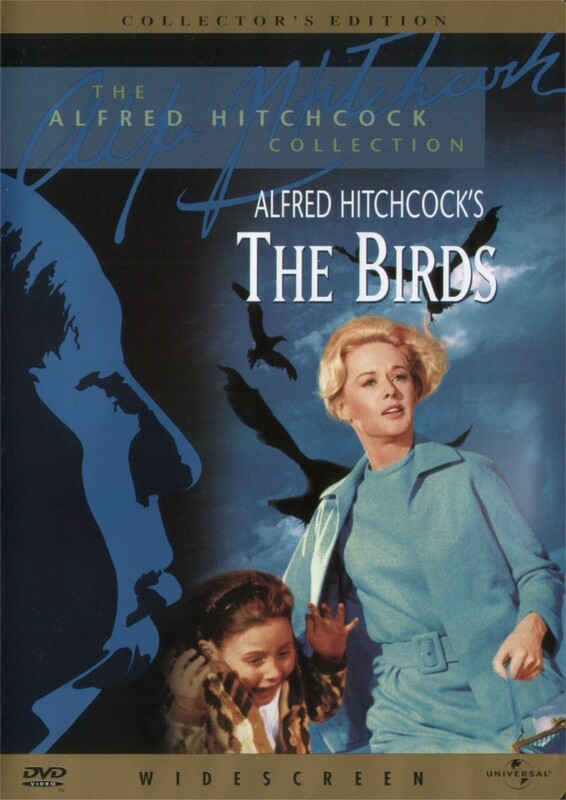 The Birds showed Hitchcock failing by clinging to a formula that made him very wealthy in 1960. While there are great moments of terror, the characters in The Birds are not compelling enough to carry us through scene to scene. Because it is Hitchcock we stay, but you take away the birds and there is no film left.